What material is used for the filling? Does the filling create noise in the pillow? Is the pillow too big? Does a part of your body hurt? As the tummy expands due to pregnancy, sleeping becomes a challenging task for many mothers. Carrying the baby inside the womb means gaining weight and a change in body size. Because of this, your sleeping position and habit may also change. You will need to have a sound sleep every night for the growth and development of the baby and for your health as well. To sleep soundly, investing on a pregnancy pillow can be your wise decision. Pregnancy pillows come in a wide variety of styles, shapes, and sizes. Before you buy one, check each brand and style, whether it matches your requirements, from this list. This pillow is a wedge that you can easily slide under your body or tummy when sleeping to give you the support for the tummy. It is actually a favorite of many women, not only during pregnancy, but even after giving birth. It offers the comfort and support when sitting or lying down. This type of pillow is available in rounded wedge and in triangular wedge. Under your tummy – As you lie down on your side, the pillow will support your tummy comfortably. Under your pillow – To keep your head elevated when sleeping, you can put the wedge pillow under the pillow you regularly use. Full length pillow is commonly known as body pillow. This type of pillow is available in straight full length and flexible full length. The flexible one can be twisted depending on your use, while the straight one stays on its shape. Being a full length pillow, you can rest your head on one of its end while cuddle its body against your body for a more comfortable sleep. Although this is the pillow that pregnant women can use to cuddle when sleeping, it really does not provide the needed support for the back. But because it is a full length pillow, it stays in place and it avoids scattered pillows on your bed when sleeping. The straight type looks like a regular pillow you would sleep on only much, much longer. Hug it or cuddle it when sleeping. Put it between the legs and between the arms while lying on your side. The total body pillow is a type of pillow that is designed to wrap your body. It comes in 5 to 6 feet in length and it provides the full support and comfort that you need when sleeping. Available in C-shaped and U-shaped designs, you can curl up your body inside the pillow for a better sleeping position. Resembles the shape of the letter C.
Ride it with the longer part on your back for support. Ride it with the longer part in front. Curl up inside the pillow with your head over the pillow and your arms and legs around it while your back is supported. Due to pregnancy, most women become sweaty even when sleeping. The pillow is the first thing to absorb the sweat, which is why it is best to change the cover from time to time. If the pillow has no cover, it will be difficult for you to wash it clean, especially if it is a body pillow. Another thing with the cover, it should be easy to remove and the pillow to slip on. Styrofoam balls are the small white balls usually used in bean bags. Polyester is a soft fiber common to pillows, but this material is not breathable. Micro-beads are fine balls in 1/32 inch wide and are light in weight. It makes no noise but it lacks support. Memory foam takes the body shape and weight in memory when pressed against it. It is firm but it provides support to the body. The most common natural fillings for natural pregnancy pillows are the spelt, wool, and kapok, but they are not automatically means they are organic. You still have to take a closer look on that if you are after organic fillings. Based on its filling, the pillow may have a noisy sound that may disturb your sleep. This is an important factor in choosing the pregnancy pillow you will buy and use for each night. Pregnant women are prone to allergies due to hormonal changes and sensitivity, and that is a very risky condition. When choosing a pillow, check whether it is hypoallergenic to prevent allergic reactions to its materials. Big pillows are good, but if it will only occupy the entire bed, your husband will definitely take the pillow off the bed. Choose one that is big enough for you and not the bulky one. Soft pillows are good to cuddle, but during pregnancy, too much softness may lack the support you need. On the other hand, too much firmness may also disturb your sleep and may also cause your body to ache when you wake up. Check where it really hurts and see whether you provided the right support to it when sleeping or sitting. The hurt may have caused by the lack of support, which requires you to get a better pregnancy pillow for support. 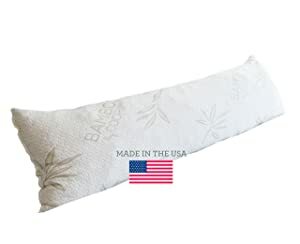 This brand of pregnancy pillow is popular for its unique shape and length, allowing pregnant women to have the most comfortable sleep in their desired position all throughout the night. This pregnancy pillow allows you to turn to any position you want with all the support, from the head to the legs, you will get the support you need. Both the ends can be locked for an instant nursing pillow when feeding the baby. 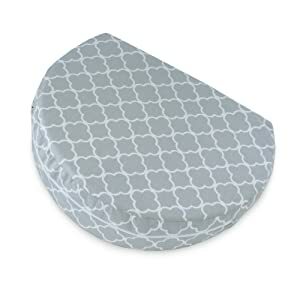 This wedge pillow for pregnant women is firm enough to support the tummy, and it is lightweight and versatile for a comfortable sleeping position. The cover is made from cotton material and is removable, washable, and with a zipper for closure. With shredded memory foam, this pregnancy pillow conforms to shape and weight of the body to provide the support the body needs for the entire pregnancy period. Despite being probably the most coveted phases of a woman’s life, pregnancy comes with it’s enough share of discomfort. As the baby bump grows larger, the woman may have trouble catching a good night sleep and resting during a particular position. However thanks to the advent of being pregnancy pillow, women can now. Worth reading these reviews. I’ve looking around to buy a pregnancy pillow and reading these reviews are helping me a lot what type of pillows would be good fit for me.